It’s reproduced from an article I wrote for that excellent site and is a list of twelve different memories from the original Nottingham Ice Rink located on Lower parliament Street, Nottingham, which part of the modern Nottingham Arena now stands on. 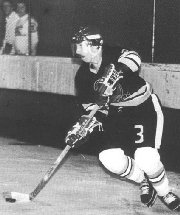 The memories and nostalgia travel right back to season 1980/81 when The Nottingham Panthers were reformed and brought back to The Lace City. The man who made it all possible. 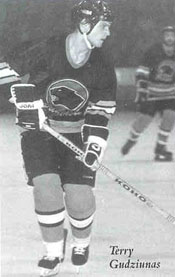 Gary Keward, Coach and reformer of the modern era Nottingham Panthers. Whilst the memories itemised here and mostly positive one, It’s important to add that not all my experiences were as savoury when visiting the old barn. I could probably wax less than lyrical on that subject though that’s probably another article entirely. In the meantime, here are a dozen of the best that come immediately to mind. I’m sure any fan of the Black and Gold, and a good few visiting fans will find pleasant memories jogged by the following. 1. The tiny little tuck shop with the sweetie jars as you turned left after the front foyer. Always a friendly face or two peering out from the little store on game night. None of that ‘concessions’ nonsense. 3. Ice that was like skating on tarmac. How many stepped through the gates and got out there for a spin? Loved the excellent ‘corrugated’ affect near the player’s gate. 4. Two welcoming and atmospheric bars. The beer and food supplies at the new stadium are okay but I miss those two bars, which I would use alternatively. The bar staff also had the intelligent knack of pouring off around 2800 pints in preparation for the thirsty Panthers punters who would shortly be clambering over the bar with their tongues hanging out. How it looked. Looking towards the stage end, before the crowds flocked in. 5. Opposing hockey fans having a great time just talking hockey together in kindred spirit. Remember those days – when we were all in it together? Sure there was less savoury stuff at the likes of Durham and Whitley but it was always a great pleasure to converse with the odd travelling fans in those early days of the 1980s’. For the diminutive, crazy band of us that followed hockey in those days it seemed like ‘us against the world’. 6. 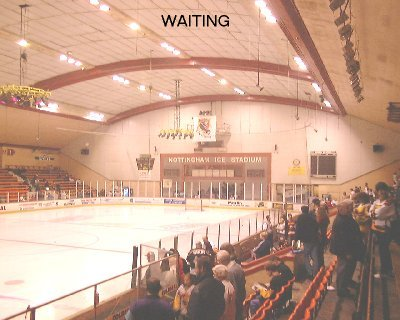 The stadium filling up with cigarette smoke in the third period as nervous punters were on the edge of their seat wondering if we could actually beat Streatham at last. Being a non-smoker I, of course don’t actually miss this one, (apart from beating those damned Redskins of course – thank you Terry Gudziunas and Jeff Andison). Two of my great favourites of the time, Canadians Jeff Andison (left) and Terry Gudziunas. 7. Scoring 31 goals in one night (against the hapless Southampton Vikings). A bad night for Southampton and it was difficult not to feel sorry for them as they were mostly young guys and tried their heart out against the superior and mainly Canadian born and bred Panthers. Happily the two goals that the Vikings got received the biggest cheer of the night. 8. A four-page A5 Ice Hockey News Review in a tiny type size with no margins (blink). I used to descend from the Ice Stadium with this Holy Grail stuffed inside my jeans pocket for perusal later. Unfortunately after seven pints of cheap lager (Ayingerbrau anyone?) around town this was generally a difficult if not impossible task after returning home. Where’s that magnifying glass? 9. Sew on Montreal Canadiens and Toronto Maple Leaf Badges that somebody had ‘acquired’ in Canada and sold in the rink. Still got ‘em too. I’m saving the Leaf ones for someone I don’t like. 10. The sight of the great Les Strongman skating occasionally. Beautiful, graceful and fluent it was too. An older guy by now but the natural class was still there even to the uninitiated. 11. Eric on the organ. Anybody remember ‘Three Blind Mice’? Hockey means organ music, none of this new-fangled ‘dance’ music or those young teenyboppers Status Quo. Eric was great. I had the father-in-law over from Canada once and he was stunned when walking into the old stadium to hear Eric’s strains of Bach floating down the corridors. Authentic and the real thing. 12. Going out to the pub in the intervals between periods. Yes we actually used to do this to either The Cricketers or The Castle. You had to be quick (and dedicated) but it was worth it! Full marks to anyone who could make the time to swill down more than one pint between periods. There we are then, twelve memories. They were happy days, the very early ones were pretty magical actually. I’ll never forget the buzz around the game in Nottingham in those days. I’m sure though that Arena generation fans will also have lots of their own memories to recall in the years to come too. My memories of the ice stadium go even further back. In the early 1970’s this was our Saturday night destination of choice and a great place not only to skate but also to discover drinking and girls (both of which I did). But, ice was clearly in my blood because my mum and dad met at the ice stadium in 1949 and supported the original Panthers (Les Strongman, Chick Zamick, et al). What a nice story! Do you ever venture into the current stadium? 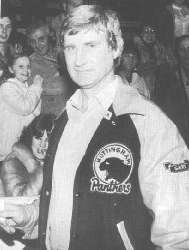 One thing I loved about that first season or two when the Panthers reformed in 1980 was the way that many of the original fans from the fifties came back twenty years later – often to reclaim the same seats. Queuing for long stretches of time for tickets as we used to in those days, I used to be an avid listener to these old fans and their conversations about players and games from the earlier era – fascinating stuff. I managed to be in the seats for the last-ever game at the old stadium. Les and Chick were there amongst many others and it was a pretty poignant night for many. Been down a few times Stuart but the magic seems to have gone. Those rose-coloured glasses that nostalgia gives you just don’t seem to work inside the new arena. I have to agree to an extent. I still like to attend the odd game for my ‘hockey fix’ but my interest in watching the Panthers every week sadly waned. I guess I’m a bit fortunate too in that I get to watch a few quality games in Canada here and there. I’m right with on skating! I once heard it described as ‘the nearest thing to flying’. I’m not sure about that but it’s a very special feeling, even more so if you’re fortunate to have ever skated in the great outdoors. What year did the Cricketers close? Not sure about that Lynne. The Arena has been open for ten years now and The Cricketers did survive in it’s new shadow for a little while as I recall.